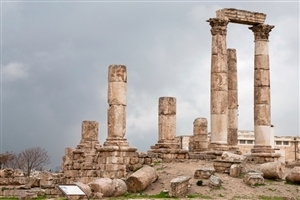 Visit the mystical country of Jordan and follow an ancient trail laid out before you filled with biblical significance and breathtaking ancient landmarks in one of the most cultural Arabic lands. 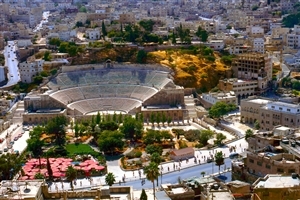 Explore the popular capital, Amman, and indulge in the local lifestyle. Visit Wadi Rum, the unique historical landscape barely touched by humanity. Traverse the famous Siq gorge and witness the once ancient tomb Al-Khazneh. 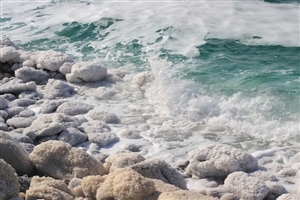 See the breadth of the Dead Sea, the lowest point on Earth. View the biblical Moses’ memorial atop the majestic Mount Nebo. 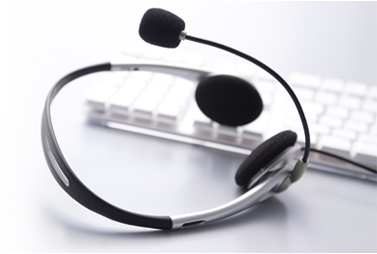 Arrive in Amman International Airport where you will be met by a representative before being transferred to your hotel. 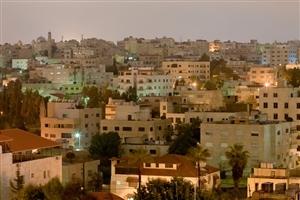 Spend the day after breakfast exploring Amman, the stunning capital of Jordan. After breakfast, drive to Madaba, home of the ancient 6th century Mosaic Map of Jerusalem and the Holy Land. 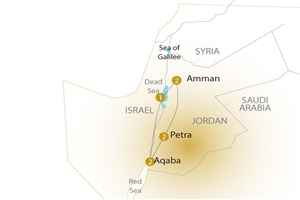 Continue on to Mount Nebo, where the memorial of Moses resides, along with blindingly beautiful vistas of the Jordan Valley, Dead Sea and Jordan river, finishing off the tour in Petra. Begin your exploration of Petra, a treasure among treasures to be found in the country of Jordan. An ancient city carved into the very rock face that was once pivotal in its importance of the silk and spice trade routes between China, India and Arabia with Egypt, Greece, Syria and Rome. To enter the city you must travel through the Siq, a slender chasm shadowed by soaring, awe-inspiring cliffs. The Siq ends with a vision of Al-Khazneh as it comes into sight; an intricately carved temple that resides in the pink rock and served as the crypt of a king from a time long ago. Today you will be transferred to Wadi Rum; also known as ‘The Valley of The Moon’, this marvellous location has barely been touched by humanity and flourishes in its own natural splendour. With a wealth of history that lives within, including being the location of the headquarters of Prince Faisal Bin Hussein and T.E. Lawrence during the Arab Revolt in World War 1, the surrounding offer a unique tour experience. To follow, a jeep tour will take you inside Wadi Rum on to Khazalee Mountain and Sand dune before continuing on to Aqaba. Spend the day at Aqaba, a captivating Red Sea resort that is often overlooked by tourists, but provides a number of fun activities, luxurious facilities, modern shops, and historical sites to make the trip worthwhile. Transfer today to a hotel in the Dead Sea; the famous salt lake which is one of the saltiest bodies of water, and the lowest point on Earth. The salts and minerals produced here provide industry, agriculture, and medicine with a number of products. Transfer to Amman Airport after breakfast for flight home. All transfers in a private A/C Tourist Vehicles with English Speaking Driver.